Martial dances pertain to war, combat, or duel movements common to dances for men. In the context of Philippine dance, these dances symbolize manhood. It can mean community acceptance in the council of warriors as practiced in the Mangayaw of the Bontoc - a tribe in the Cordillera Region of Northern Luzon. The Mangayaw is a a pre-headhunting ritual performed by adult villagers where new warriors are presented to the council. The combat dances of the Bontoc, Ifugao and the Kalinga in the Cordillera Region commonly represent the distinct bravery of their people. Kayaw is a headhunting expedition of the Kalinga performed in a ritual called Idaw. The ritual shows a bird of omen in which warriors observe insects entering in an offered plate, that will later indicate the number of heads to be taken, upon a consultation with a ritual practitioner called a Mandadawak. The Ifugao Monhim-ong ritual is a dance-like activity after a violent death of a member of a community. The men move in a single file rhythmically beating instruments called bangibang. The Kalinga also celebrate victory through dancing. They perform the Takiling after a successful headhunting expedition of the Mingao or the crowned heroes. Dressed with colorful lawi or rooster feathers on their head and accompanied by the beating of the ganza (gong), this dance is performed by the Bodans. Another northern tribal group, the Bontocs also depict their people's unique character through dancing. The Bontocs' Pattong exhibits a mock combat dance where performers brandish head axes and spears together with the clashing of shields. A bigger crowd dancing the Balangbang also shows a duel or combat of two warriors who later joins them. In this dance, the hide and seek movements which follow the rhythm of the ganza (gong) dramatize the killing. The dancing crowd shields the warriors from clashing with each other. A closed dance formation represents the shielding and an open dance formation depicts the duel or fight scene. The most common among Philippine martial dances exhibit the use of equipment or hand props with varied weapons such as head ax, spear, bow and arrow, shields, bolo, kris and knives. In today's dancing, these weapons are considered already part of the dance as hand or body properties are. The proximity of Philippine shore to the Malay Peninsula accounts for Malay influences in the martial dances particularly, those found in the islands of Jolo, Sulu, the southern most tip of the archipelago. Langka, the term use to mean dance , has many types: Lanka-Silat, Langka-Pansak, Langka-Lima and Langka Budyang. 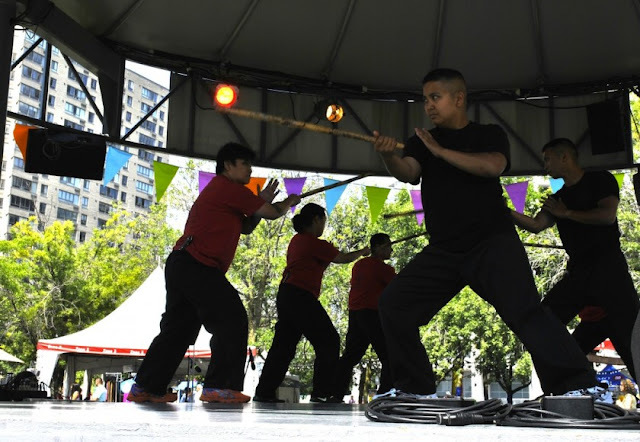 Langka Silat is a dance simulation of a fight in graceful and flowing arm movement. This is almost the same as the Burong Talo, which is an imitative dance of the fight between the cat and the eagle in flight. Also, of the langka tradition is the Langka-Pansak - a variation of slow-paced movements punctuated by a momentary pause at the end of every stance sometimes emphasized by the use of pis (over-sized handkerchief). Langka-Lima, on the other hand, provides a combat variation featuring five defense positions. There is also the Langka-Budyang, the only martial dance variation performed by women in graceful leaps and kicks characterized by feminine arm thrusts and the use of a fan. The semblance between and among these martial dances is closely compared to other Asian martial arts movements related to the Chinese Taichi and Kung-fu. In fact, the Langka-Silat is similar to an ancient Sumatran martial art called bersilat of the Malakan Sultanate. Down south, the Maguindanao display an intricate gesture and combat movement in a dance called Sagayan-silat. Performed by a very fierce warrior carrying a shield and a kris, the dance involves leaping, turning, jumping, kicking and the rolling movements of a warrior ready to defend his master in battle. On most occasions, this dance is performed before any celebration or gathering to drive away evil spirits and to welcome good fortunes or omen. The Manobo of Agusan del Sur and del Norte pride themselves in the dance called Binanog. Here, the warrior mimics a combat movement trying to fight the Banog (big eagle) in defense of a troubled hen and her chicks ending a heroic display of killing the Banog. The Mandaya perform the Saot using kasan (spear) with the beating of gimbal (drum) and agong (big gong). The Subanon of Zamboanga del Norte perform a combat-like gesture or movement in a dance called Sohten, a generic name for all male dances of the Subanon. The warriors carry on their hands a cut of dried and crisp palm leaves and a decorative shield with tinkling bells believed to have the best sound to please their gods. Choreographed fighting also inspired the Filipinos to develop a dance called Sabong where dancers imitate the movement of the fighting roosters. These martial dances show Filipino bravery and a distinct cultural tradition marked by warriors ready to defend their tribes or to avenge the death of their tribesmen. As such dancing indeed becomes a form of expression mirroring clearly the soul of each tribe, of the nation. About the Author: Larry Gabao earned his doctorate in Educational Management at the Polytechnic University of the Philippines. He is the president of the Philippine Folk Dance Society, Cultural Center of the Philippines and chairs the Physical Education Department of the Philippine Normal University.